India Inc is doing its bit to encourage employees to cast their vote. Offering paid leave on voting days is just the start. For instance, Walmart-owned Flipkart is organising voter registration camps for employees as well as their families, The Economic Times reported. These camps are meant to facilitate not just first-time voters but also those seeking to shift registration to a different constituency. Bangalore-based unicorn Swiggy on the other hand has not only rolled out a #votekarophirswiggykaro campaign that is getting rave reviews but is also offering its delivery staff 'Swiggy Smiles' reward points for getting inked as part of the campaign. The ad campaign, incidentally, offers a menu card for the "Nation's needs", covering items like affordable housing for all, ending red tapism, increased job opportunities, loan waivers, zero criminals for politicians and crackdown on black money, among others. When you click on any of the options, you get the following message: "Sorry we are not there yet. Unfortunately, there are some things you can't get delivered home. So this general election, step out and vote." A very creative way of reminding people about the value of voting ! Many companies are sending out information on voting dates by constituency to their employees. BSE is also sending texts urging employees to vote along with running a campaign on its social media handles. While a large number of firms, including L&T, Mahindra & Mahindra, Infosys, Deloitte, Accenture, Domino's and Dunkin Donuts, both run by Jubilant FoodWorks, H&M and Titan, have given employees a day off to cast votes, Samsung has done one better. The South Korean consumer durables giant is also offering employees time out to go back to their constituencies to cast their votes - and these days won't be counted as leave. A spokesperson told the daily that this move to not consider voting-related travel as leave is the first such initiative by Samsung. Some are falling back on Indians' love for discounts. The Tamil Nadu Hotels Association (TNHA) has reportedly come up with an offer of a 10% discount for voters. Just show up at a TNHA eatery after 6 pm on April 18 and show your inked finger along with your voter ID to avail the discount. Around 1,200 eateries, including popular brands like Hot Chips and Saravana Bhavan, are part of the group. 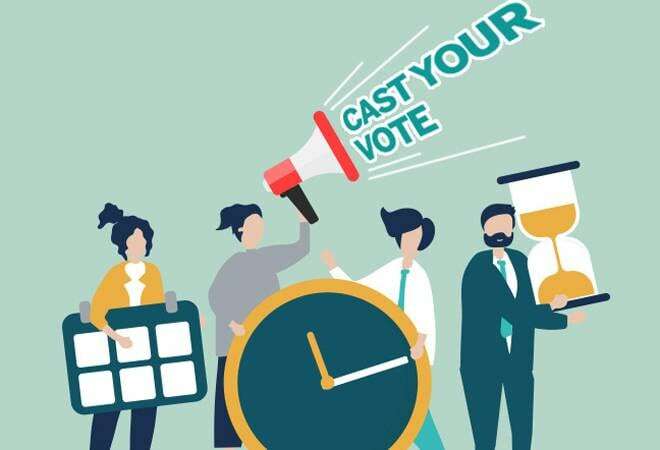 Social-networking site Facebook, last month, launched two new India-specific tools called "Candidate Connect" and "Share You Voted", to boost civic engagement on its platform during the general elections that commence in April, IANS reported. While "Candidate Connect" will help people learn more about candidates, the "Share You Voted" will provide people with polling information and enable them to announce and celebrate their vote. Another social media giant, Twitter, launched a social initiative called #PowerOf18 last November to encourage first-time voters. The campaign leveraged on insights gathered from a survey conducted by the company that focussed on 18- to 30-year-olds' attitude in shaping India's political and social environment. Interestingly, the study found an overwhelming 94% of respondents from a base of over 3,600 youth indicating that they will vote in Elections 2019. Leading dairy player Amul is similarly leveraging brand reputation to encourage voting. The company is reportedly printing a 'go and vote' message on 3.5 crore packs of milk daily, for 10 days. As for Google, it predictably had an election-themed doodle on April 11, when the polling juggernaut started rolling.